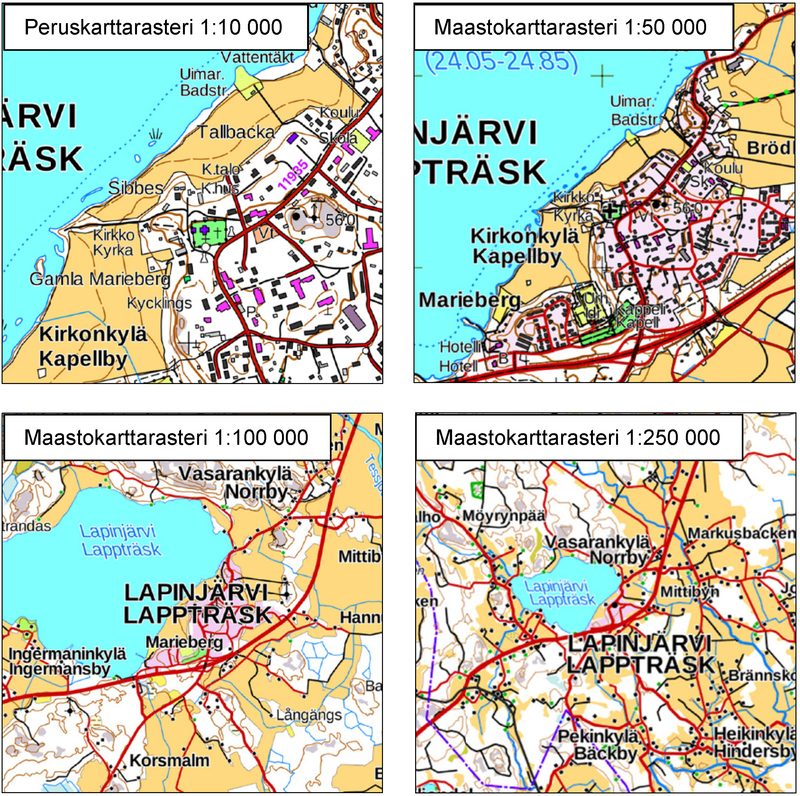 Municipal Division is a dataset depicting the municipal division in the whole of Finland. The Municipal Division dataset is produced in scales 1:10,000, 1:100,000, 1:250,000, 1:1,000,000 and 1:4,500,000. The data included in the dataset in scale 1:10,000 are taken from the cadastral registry. Regarding other scales, municipal boundaries have been generalised to suit the scale in question. The Municipal Division dataset is available as products both in vector and raster format. The products in vector format contain the number codes of the municipalities, the names of the municipalities both in Finnish and in Swedish as well as municipal boundaries and municipal regions. In addition, the vector product includes the corresponding information about the county regions and the State Administrative Agencies. Products in raster format include municipal boundaries only. The product belongs to the open data of the National Land Survey of Finland. More information: Topographic data and how to acquire it http://www.maanmittauslaitos.fi/en/maps-and-spatial-data/expert-users/topographic-data-and-how-acquire-it . The Finnish Forest Research Institute (Metla) developed a method called multi-source national forest inventory (MS-NFI). The first operative results were calculated in 1990. Small area forest resource estimates, in here municipality level estimates, and estimates of variables in map form are calculated using field data from the Finnish national forest inventory, satellite images and other digital georeferenced data, such as topographic database of the National Land Survey of Finland. Five sets of estimates have been produced for the most part of the country until now and four sets for Lapland. The number of the map form themes in the most recent version, from year 2009, is 43. In addition to the volumes by tree species and timber assortments, the biomass by tree species groups and tree compartments have been estimated. The first country level estimates correspond to years 1990-1994. The most recent versions are from years 2005, 2007 and 2009. MS-NFI 2011 will be ready early 2013. The first set of the products freely available are from year 2009. The new set of the products will be produced annually or biannually in the future. The map from products are in a raster format with a pixel size of 20mx20m and in ETRS-TM35FIN coordinate system. The products cover the combined land categories forest land, poorly productive forest land and unproductive land. The other land categories as well as water bodies have been delineated out using the elements of topographic database of the Land Survey of Finland. The Finnish Forest Research Institute (Metla) developed a method called multi-source national forest inventory (MS-NFI). The first operative results were calculated in 1990. Small area forest resource estimates, in here municipality level estimates, and estimates of variables in map form are calculated using field data from the Finnish national forest inventory, satellite images and other digital georeferenced data, such as topographic database of the National Land Survey of Finland. Six sets of estimates have been produced for the most part of the country until now and five sets for Lapland. The number of the map form themes in the most recent version, from year 2011, is 45. In addition to the volumes by tree species and timber assortments, the biomass by tree species groups and tree compartments have been estimated. The first country level estimates correspond to years 1990-1994. The most recent versions are from years 2005, 2007, 2009 and 2011. The maps from 2011 is the second set of products freely available. The new set of the products will be produced annually or biannually in the future. The maps are in a raster format with a pixel size of 20mx20m and in the ETRS-TM35FIN coordinate system. The products cover the combined land categories forest land, poorly productive forest land and unproductive land. The other land categories as well as water bodies have been delineated out using the elements of topographic database of the Land Survey of Finland.